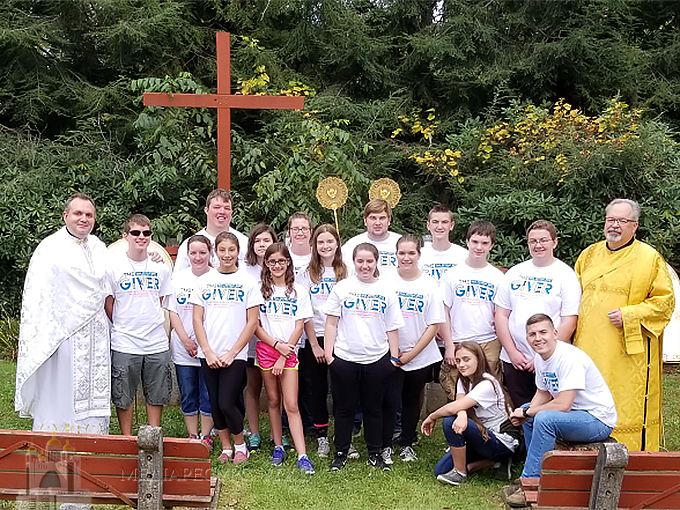 Youth, young adult leaders, volunteers, and clergy from the States of Ohio and Pennsylvania of the Ukrainian Catholic Eparchy of St. Josaphat in Parma gathered together on October 7-8, 2017 at Crestfield Camp & Conference Center in Slippery Rock, PA for the annual Fall Youth Retreat. Crestfield Camp & Conference Center was truly alive with youth, chaperones, and clergy at the annual Fall Youth Retreat that took place on October 7-8 of this year. The retreat, organized by the Eparchial Youth Committee under the leadership of Fr. Lubomyr Zhybak, the head of the committee and pastor of Holy Trinity Ukrainian Catholic Church in Youngstown, OH and St. Anne Ukrainian Catholic Church in Austintown, OH and Mrs. Lisa Hladio, the coordinator of the retreat, provided an opportunity for the youth to spend time with the Lord and their fellow retreatants through prayer, learning, and playing in the spirit of the Ukrainian Catholic faith and fellowship. The theme of the retreat this year was “The Giver” based on the Second Letter of St. Paul to the Corinthians 9:6: “Those, who sow generously, will reap generously.” Young people from Grades 7 to 12 enjoyed the beautiful and picturesque Western Pennsylvania surroundings while participating in prayer, confession, reflection, fun games, and community building. Retreat began with the Third Hour, celebrated by Fr. Lubomyr Zhybak and cantored by the retreatants under the leadership of Lisa Hladio, who led everyone in song and prayer throughout the retreat. Afterwards the registration opened, which was followed by the team building exercise directed by Allison Cross from Sts. Peter and Paul Ukrainian Catholic Church in Ambridge, PA. Next, the retreatants were able to participate in the fun and exciting game called “Capture the Flag,” led by Bohdan Mykhailiv from Holy Trinity Ukrainian Catholic Church in Carnegie, PA. After the game, everyone prayed the Sixth Hour, led by Fr. Lubomyr Zhybak that was followed by a delicious lunch. After the midday meal, youth and chaperons participated in the “Ultimate Frisbee” game and canoeing, which was followed by campfire dinner and “Evening Club,” led by Lisa Hladio. Next, the retreatants were able to partake in the Holy Mystery of Confession led by Fr. Michael Polosky, Pastor of Sts. Peter and Paul Ukrainian Catholic Church in Ambridge, PA and Sts. Peter and Paul Ukrainian Catholic Church in Aliquippa, PA and Fr. Jason Charron, pastor of Holy Trinity Ukrainian Catholic Church in Carnegie, PA and Our Lady of Perpetual Help Ukrainian Catholic Church in Wheeling, WV that was preceded by an examination of conscience. Afterwards, Fr. Michael Polosky had a spiritual talk around the fire, which was followed by Small Compline led by Fr. Jason Charron with the assistance of Deacon Myron Spak from Holy Trinity Church in Carnegie, PA and member of the Eparchial Youth Committee. The day concluded with a spiritually edifying movie night, prepared by Alex Lischak, a young adult leader from St. Anne Ukrainian Catholic Church in Austintown, OH, who, together with his brother Nate Lischak, Mrs. Vicky Freed from Sts. Peter and Paul Ukrainian Catholic Church in Ambridge, PA; et al. were the chaperons this year. The second day of the retreat was prayerfully commenced with the First Hour service, which was followed by breakfast. After the morning meal, Nate Lischak addressed the young people, sharing with them his life of faith, particularly serving now in the United States Air Force. His talk was followed by a fun hay ride and high ropes activity, led by the Crestfield staff. Afterwards, everyone partook in the Sixth Hour prayer service that was followed by lunch. The retreat concluded with an open-air celebration of the Divine Liturgy, presided over by Fr. Lubomyr Zhybak, who was assisted at the altar by Deacon Myron Spak with the responses provided by the youth and chaperons under the leadership of Michael Spak, a young adult leader from Holy Trinity Ukrainian Catholic Church in Carnegie, PA. During his homily, Fr. Lubomyr explicated the theme of the retreat, having encouraged all present not to be afraid to sow generously, namely not to fear to be courageous witnesses of our Lord and Savior Jesus Christ, having surrendered totally to Him, which in turn would yield rich spiritual fruits while maintaining an authentic friendship with the Lord. This year’s fall youth retreat was a great spiritual, prayerful, and engaging event for the eparchial youth that provided an opportunity for the participants to grow in holiness, having a genuine relationship with the Lord. The next retreat is planned for October 6-7, 2018.